Meet Zidgel, Fidgel, Midgel and Kevin - the wackiest penguins to ever leave the solar system! Hilarious fun, biblical lessons, and godly values in a brilliant animated series from the creators of VeggieTales. 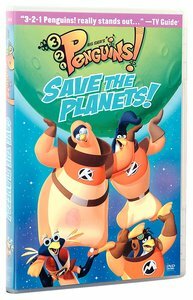 About "Save the Planet (#07 in 3-2-1 Penguins Video Series)"